If you were asked to envision an injured professional sports competitor – any injured competitor – a pro angler probably wouldn’t come to mind. But as any professional angler would tell you, competitive fishing offers its share of hazards. Try moving as quickly as possible for eight to nine hours of competition, often for four straight days, hopping from bow to stern on a bass boat, bending constantly, casting over and over, and perhaps trying to land a bundle of three- to six-pound bass. When “they’re biting good,” as anglers say, see how your back, neck, legs, shoulders, wrists and arms feel at the end of the day. Perhaps just as grueling, however, is driving a bass boat – sometimes up to 75 miles per hour – over unpredictable water, perhaps negotiating torrential rain or Lake Erie-style winds that cause six-foot waves. 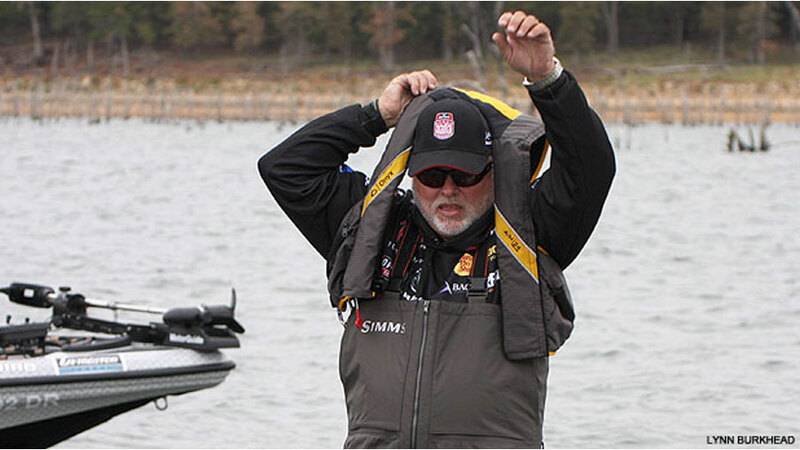 “Nothing takes a toll on a person's back like driving a boat in the conditions that pro anglers face,” said Major League Fishing angler and former Bassmaster Classic champion Alton Jones. “I can’t point to a specific moment and say, hey, this is how I got injured. Or I can’t say driving a bass boat absolutely caused my back problem,” Jones said. “What I can say with certainty, though, is that we endure pounding conditions, rough on a regular basis and brutal on an occasional basis. Your posture is not always good. I’ve been in driving rain where I’m trying maneuver a boat, but at the same time I’m practically lying down trying to protect myself from weather. Young anglers feel it. More experienced anglers with, say, 20 years or more of tournament history, feel it more acutely, and many routinely wonder, strictly because of pain, how long they can stay anywhere near the top of their games. What pro anglers do believe, however, is that if they can live relatively pain-free, they can compete at a high level. That’s where BACAS – the Houston, Texas-based, interventional pain management practice – comes in. Whereas BACAS has been treating a variety of patients since it opened its doors in 2006, BACAS doctors have developed specific sports-injury and recovery programs designed for professional athletes. And with programs for football, baseball, tennis and basketball players already in place, BACAS recently added an “angler-specific” initiative. When working with anglers, BACAS addresses pain from the feet to the head, with aggressive treatments for such ailments as: tendonitis, neck and back stiffness, migraines, torn rotator cuffs, dislocations, sprains, hamstring pulls, natural wear and tear and overtraining issues. The BACAS team includes four physicians with varying specialties and backgrounds. This allows BACAS to offer what Senior Executive Vice President Melonie Butler terms a “multidisciplinary approach” that is unlike any other. “Our physicians have different specialties, and they collaborate in order to deliver an accurate diagnosis,” Butler said. “They are methodical and diligent in pursuing a patient’s pain triggers. They absolutely will find – and deal with - the root causes of pain,” Butler said. Butler is dead-on accurate, according to Jones and fellow Major League Fishing angler Tommy Biffle. The two champion anglers said the program has meant nothing short of a new beginning for them. Both were experiencing extreme lower-back pain. Now, both say they feel years younger. Jones tells a similar story. “I don’t like going to doctors. I don’t really know why, I just don’t. But I decided it couldn’t hurt to talk with the BACAS people. And I liked the fact that they were honest with me from the start. They told me that what they offer is not a cure, but it will decrease pain, increase quality of life, and it will let me do my job as an angler,” Jones said. Although the BACAS medical workup is comprehensive and detail-oriented from top to bottom, the philosophy BACAS utilizes is not complicated. BACAS follows three basic tenets: treat the patient with respect, find the root cause of the patient’s pain, and then reduce or completely get rid of the pain. BACAS Founder (and physician) Nelson K. Bond said what Jones and Biffle have experienced is typical. “Pain is mediated by nerves and electro-chemical transmitters. You cannot feel pain without these pathways being activated by injury,” Bond said. In addition to treating Jones and Biffle, Bond recently spent time Major League Fishing anglers, watching them work. As is true with Jones, Biffle said he couldn’t point to a single traumatic incident that caused his back pain. He just knew that there were days he could hardly move, and that’s no way to try winning a Major League Fishing or B.A.S.S. Elite Series event. Butler said, “We are change agents. Our patients run the gamut. We’ve worked with, for example, a grandmother who could no longer pick up a child she loves, her granddaughter. We got her to the point that she is no longer in pain and has her granddaughter every week,” Butler said. While medical treatment of the injury is certainly primary, BACAS offers a second, almost equally important tier to its services. BACAS believes in resurrecting an “old school” medical tradition: good bedside manner. For a patient, a visit to BACAS ordinarily lasts two day. The visit includes actual concierge service. BACAS assists with transportation to Houston, arranges hotel accommodations and handles travel to and from its clinical locations and testing sites, where a patient undergoes a full diagnostic review, including MRI and EMG (Electromyography) testing, as necessary. Butler laughed when she heard Biffle’s description of his first-night experience. She said, yes, Tommy Biffle did indeed walk around the mall that evening. And he wasn’t supposed to. “I told him, ‘Tommy, you were supposed to take it easy for a couple of days. You weren’t supposed to be out walking around all night,’” Butler said.